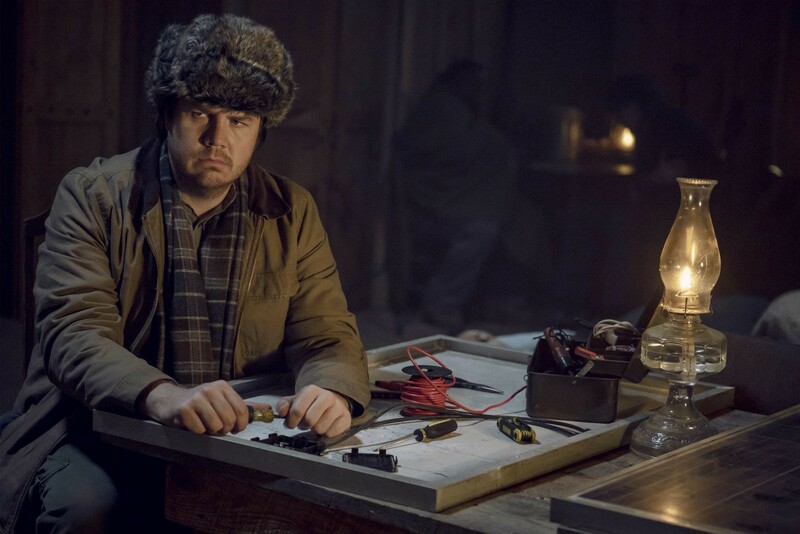 Savvy Walking Dead fans who've been eyeing Eugene's work with the radio over the course of Season 9 have been expecting a connection of some kind at some point. Some theorized Rick Grimes, missing in action after the bridge explosion six years ago, would show up in voice form just in time for the end of Season 9. Well, it turns out the season does end with a voice on the radio — it's just not Rick's. The 16th and final episode of Season 9, "The Storm," unfolds slowly but surely like the season has. The sad news is The Kingdom is no more. And neither are Ezekiel and Carol. Crushed after the loss of Henry, Carol breaks up with the King. 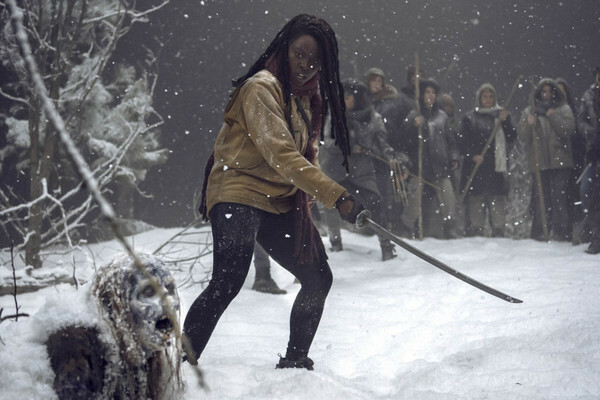 The two join Daryl and Michonne in leading the people to Hilltop to join with the others, but a storm brews and they're quickly caught in a whiteout. In Alexandria, the storm causes problems as well. Everyone's gathering around the three main fireplaces trying to keep warm. Gabriel, Rosita, and Eugene even let Negan out of his cell. (His joy at being around everyone is the episode's highlight. "Okay, Father 'Not the Father.'" He ribs Gabe.) But a clogged flue sends the group out into the cold where Judith promptly runs off after Daryl's dog, Dog. Negan ends up saving her. Daryl, Michonne, and the rest of the group from the Kingdom make it to the Sanctuary where they plan to forge ahead. They have to cross into Whisperer territory and the decision could start a war. Ezekiel's against it, but they have no choice. 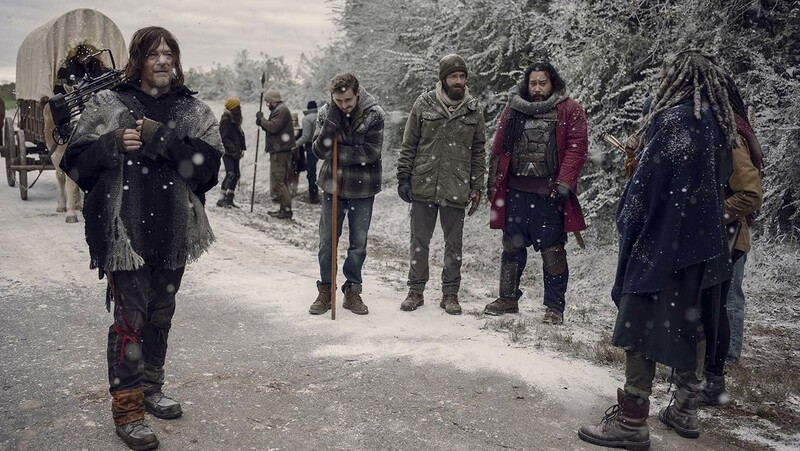 Directed by Greg Nicotero, the snowbound episode has some gnarly zombies popping out from under cover as the group fights across a frozen river. The zero visibility drama is a salute to an early comic arc that sees Rick guiding the Survivors through a snowstorm. Speaking of the comics, and more interesting than the snowy adventures, "The Storm" concludes with a female voice coming over the radio. "Is anybody out there?" In Robert Kirkman's comic book, the voice is Stephanie, a woman who becomes friends with Eugene over the radio and eventually reveals she's part of a giant community called "The Commonwealth." Now, that's likely what's going on here, but don't expect to see them anytime soon. Season 10 will probably focus on the inevitable cold war with the Whisperers. The radio voice is another piece of the puzzle, however. The world of The Walking Dead is going to open up big time. Remember Georgie? She was likely the first hint a new community would be coming to TWD sooner rather than later. And the helicopter that scooped Rick had to come from somewhere impressive. The Commonwealth is more than a scrappy community with aluminum can blockades. It's 50,000 strong, a real civilization that has football games in stadiums. It's also in Ohio so getting there won't be easy. Of course, the TV series could move the Commonwealth somewhere more practical. Time will tell. But it seems like the giant community will be a major focus of the show's future. The spin-off movie(s) Andrew Lincoln is leading as Rick may well run back into the Walking Dead storyline via the Commonwealth.